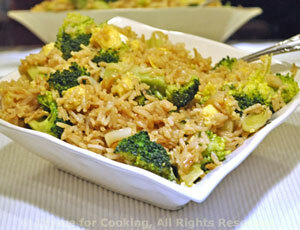 Fried Rice with Broccoli, easy Chinese side dish. Traditional Fried Rice is made with cold, leftover white sticky rice. This is a variation using fresh Basmati and Broccoli. The scrambled egg stays with the tradition. Cook rice in stock until done. Remove from heat and uncover to cool slightly. Cut broccoli into small florets and stem pieces. Put broccoli into a large nonstick skillet with 1/4 inch of water. Bring to a simmer, cover and cook 5 minutes. Remove broccoli to plate, drain skillet. Clean green onions: slice off the root, remove 1 layer of skin. Slice into 1/3" (1cm) long pieces. Put egg into a small bowl and lightly beat with a fork. Heat half of the oils in the skillet over medium-high heat. Add egg and scramble. Remove to a plate. Heat remaining oils, add onions, broccoli and stir-fry 5 minutes. Add rice, soy sauce and sherry. Stir well to combine and stir-fry for 5 minutes. Break scrambled egg into chunks, stir into rice and serve.